This charming firetruck party from The English Pea was based on a vintage fire truck found at a local fire house. The red chevrons and black dalmatian spots appear on all of the decorations and they really look great next to the rustic firetrucks. The party started at the fire house with a tour and then it was back home for treats and more fun. 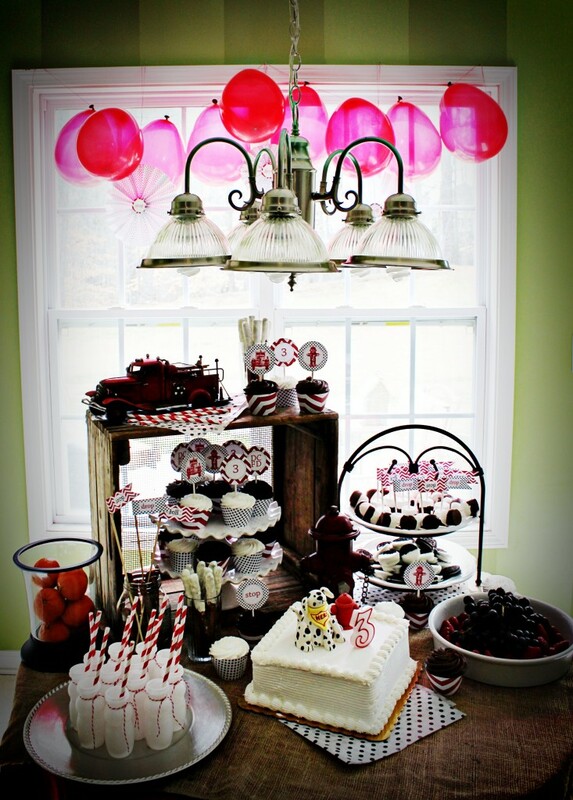 These delicious treats were placed at eye-level for the young party-goers. Fruit, milk and a great selection of sweets were a big hit. Red balloons and easy-to-make paper medallions made this window party-ready. Don’t forget to stop, drop and roll! This adorable dalmatian and fire hydrant were custom-made by a local artisan baker and placed on an inexpensive square cake purchased at Sam’s Club. That’s a great way to get a super cute, custom-looking cake at a manageable price. Flags make any food look festive. These chocolate-dipped marshmallows look so fun! Each child left with a good-bag full of Fireman’s rope (twizzlers), drops (cherry sours) and rolls (Tootsie Rolls). For your own Firetruck Party printables, check out The English Pea on Etsy. Full Size Pedal “Fire Truck” use as decor and the birthday GIFT! Thanks so much for the feature. Lovely blog!